That one guy is all like, “Mistah DeMille, I’m ready for my closeup!” I’m glad you guys read it so we don’t have to. 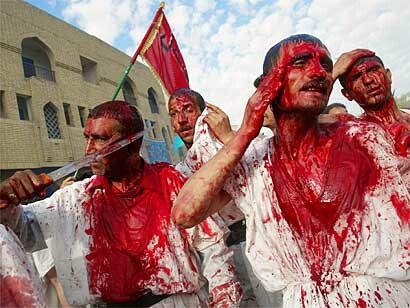 I forgot what Shiite ritual calls for beating yourself with chains and cutting yourself with knives. Not to worry though, I’m sure they’ll be just fine with a nuclear arsenal. And having the entire area on a nuclear hair trigger alert won’t have any effect on us. So, just to make sure i’m keeping track correctly. Shiites are good when they run Iraq. Shiites are evil when they run Iran. Seriously though, some evidence that the Iranian Shiites are in tune with reason and rationality is that they appear to want a nuke or two. Shi’ism might be more modern and more rationalistic than Sunnism, but anyone who assumes that those two qualities alone ensure that they’ll be more humane simply has not been paying attention.